COLUMBIA, S.C. -- No. 1 overall seed Duke -- by the skin of its teeth -- has advanced to the Sweet 16 after surviving an incredible upset bid by No. 9 seed UCF 77-76 in the second round of the 2019 NCAA Tournament on Sunday evening. After a jumper failed to fall for the Knights, Aubrey Dawkins grabbed the offensive rebound and saw a last-second layup rim out, sending the Blue Devils to the second weekend of March Madness. The matchup of Zion Williamson vs. Tacko Fall provided a window for the entire world to see Duke's star stripped of the physical advantage he has over most opponents. Williamson was limited at the rim when Fall was in the game but found about every other way to score and make an impact. 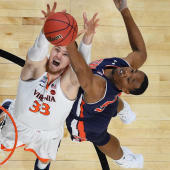 With his team trailing by three, Williamson drove to the hoop, drained a layup with 14 seconds remaining and was fouled on the play. The free throw was missed, and RJ Barrett scooped up the rebound and put it right in the basket, giving Duke its final one-point advantage with 11 seconds to play. Mike Krzyzewski had some extended time with the team as the officials reviewed a shot clock violation with 2:09 to play. It was a turning point in the game, as he told the group that they were made for this moment. They had to play defense "like there's no tomorrow" and leave everything on the floor. Javin DeLaurier got a steal, Cam Reddish hit a 3-pointer and the Knights didn't have a single made field goal in the final two minutes. "The will to win of Zion and R.J., you can't measure it. It's just there," Krzyzewski said after the game. "They're young, and we're a young group, but what they did right at the end of that game in willing us to win was just absolutely sensational." Like so many young stars in the NCAA Tournament, Barrett grew up watching this event on television. Not only does Coach K believe that he and his teammates are made for this stage and these moments, but Barrett recalled what's often happened when a team is at the free throw line with all the pressure of the win-or-go-home packed into the shot. "I was just thinking, what can we do to win this game? I remember watching March Madness and watching a whole bunch of games and seeing missed free throws, somebody gets a rebound and a putback," Barrett said. "So I thought, I'm just going to try to do whatever I can to get this rebound." UCF's defensive strategy for Duke included a lot of zone and very little concern for the Blue Devils as 3-point shooters. Duke had one of the worst 3-point field goal percentages in the country for much of the year, and UCF coach Johnny Dawkins had the Knights hustling back in transition to limit fast-break opportunities and packing it in to close passing lanes and chances to drive the basket. The strategy worked, and paired with a terrific performance from Aubrey Dawkins, had UCF in the game until the very end. Williamson scored 32 points on 50 percent shooting, hitting 3 of 7 3-pointers. He also had 11 rebounds and four assists. Fall made 7 of 10 shots for 15 points, and while he had three blocks (including a couple on Williamson), he also fouled out in just 25 minutes. Dawkins was stellar on the evening, matching Williamson with 32 points by draining 5 of 7 triples. CBS Sports was with you throughout the game, updating with stats, highlights and analysis. Check it out below.